Riah is a young girl that will fight several monsters and turn the world into a better place. 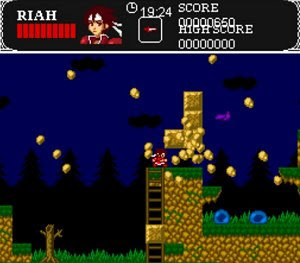 The creatures will be destroyed using weapons such as a sword, hammer, knife and others, but Riah is also a very athletic character, jumping her way from platform to platform. It’s not the visuals that stand out in this game, but the polished gameplay and level design, along with a pleasant variety of situations to deal with. It may recall Ghosts’n’Goblins, since it’s also a tough game to beat.